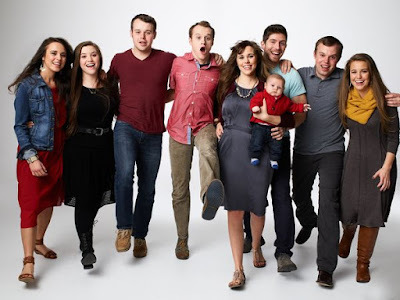 Duggar Family Blog: Duggar Updates | Duggar Pictures | Jim Bob and Michelle | Counting On | 19 Kids: Duggars Return in 1 Week! Just one week to go until the Duggars return to TLC with a full season of Jill & Jessa: Counting On! The series will focus on the lives of Jill and Derick Dillard, Jessa and Ben Seewald, and Jim Bob and Michelle Duggars' unmarried adult children--Jana, John-David, Jinger, Joseph, Josiah, and Joy-Anna. 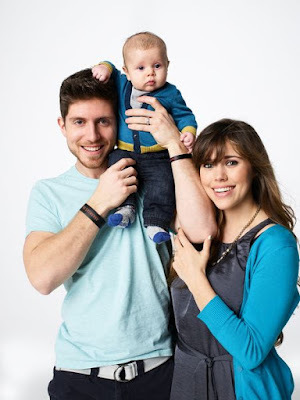 According to TLC, the season will show Jessa and Ben Seewald adjusting to parenthood with Spurgeon; Jill, Derick, and Israel Dillard continuing their mission work in Central America; Jana, John-David, Jinger, Joseph, Josiah, and Joy-Anna Duggar navigating adulthood; and Anna Duggar joining the Duggar sisters for a much needed vacation. Tune in to TLC on Tuesday, March 15, at 9pm ET/8pm CT for the season premiere. Click here to watch the promo video. Joy-Anna is way to young to be dressing so morbidly. This just makes me so sad to see. What are you talking about? Many people wear black clothing and I think her outfit is very flattering. And please look at her face...there is nothing morbid or sad about it. It never fails... someone always has to be negative. I think she is beautiful like at the other Duggar girls! I am so glad the show will be on soon! @Annon March 8 5:22 pm. Yes, many people wear black clothing including me. Audrey Hepburn made the little black dress a classic. Joy-Anna is dressed more goth than classic. All I said is it makes me sad to see such a young woman dressed in a manner that is so " dark". Clothing can be an outward expression of inward feelings. Joy-Anna is young and beautiful. I wish her clothing would reflect that. I think what the blogger meant was Joy-Anna is dressed more like Morticia Adams than fun, young and classic. I think she looks fabulous! On the question of Joy-Anna's clothing color as a possible indication of her inner state of being -- if you want to be Biblical about it ---- MAN looks on the outward appearance, but GOD looks at the heart. I can't wait!!! I'm counting down the days !!! So excited! I can' t wait! 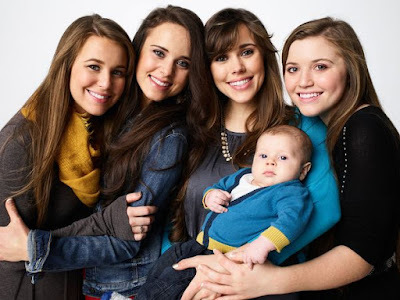 I miss seeing the Duggars! So happy they will be back. Love Ginger's new look. You can really see the resemblance to Grandma Duggar. Can't wait to see the babies and how much they have grown. I've been counting the days since they announced it, and I can't wait to see what God will have in store for them. Thanks Lily and Ellie for keeping us posted and hyped at the same time. Cheers all the way from Minnesota! I am so Happy to see your family back on TV!! You all are in my family and I continual prayers!! God Bless you all!! Oh my gosh I'm so excited! I saw a comercial earlier on TLC and I got all excited!! What is it with the kicking you heels up photo? And Joy Anna all in heavy black? She reminds me how the Greek widows dressed in my neighborhood years ago! Please stop being so rude. Would you say that to her face? I would say all of it their face. I would like to ask them many things. Wow! They look fantastic but can't help but notice the change in modesty. Much more trendier and modern. They look nothing like they did back in 2006. Love it!! I agree! Love their new look! Some would say its called growing up, maturing, changing with the times.I know I dressed way different from my teens to my 20's. Would love to see the girls wearing jeans! They're more comfortable than skirts and more practical in many ways! Yes! They used to be more plain in appearance and dress totally alike. Now they display more individual personal style and more stylish hairstyles. I can remember in one picture all the girls wore the same dress but tailored to their size. And same with the boys. Plus makeup now and no more perms!! So glad they're coming back. Its going to be like a family reunion. I would love to see the younger kids too. I used to like the interviews with Jordyn and Josie, and Johanna and Jackson. Counting down the days!Less than a week cannot wait!Love them!!! I think TLC's agenda for airing them has changed. They are lapping up the press the family has received and all the "secrets" that have been exposed. It all fits neatly into TLC's programming line-up now. TLC is probably laughing all the way to the bank. Thats what is great about America,different views different people, freedom of speech, buuut, no one gives a hoot about the first amendment when it is hateful and meanspirited...peace ❤and blessings. Then try living in a country where everyone is forced to have the same viewpoint or believe the same thing. There are plenty of them out there. I can't believe someone is complaining about having freedom of speech. That's a first! What song is on the commercial for the tip upcoming season of Jill and Jessa counting on !? The song playing in the background is "Courageous" by Megan Nicole. Thank you for answering I appreciate it !! If it is about all the adult kids shouldn't it be called simply "Counting On" and not Jill & Jessa: Counting On? It's silly. The name does not match the show. Sure it does! I think it's a very cute catchy title. Everyone knows for years it was 19 Kids and Counting, or 18 Kids and Counting, etc. The title means that even though the actual original show has stopped or been cancelled, the kids lives are still continuing on. The parents are not marketable now due to so much controversy over their parenting choices and skills surrounding Josh's scandal. The kids, however, have been victims in all of this and the audience is wondering and fascinated with how they are doing and 'counting on' after the scandal broke. OMW !!! I love ur commercial !!! What song is on it !? were is josh? is these young people say they have forgiven josh but do not trust josh what will they do when josh returns home? will anna want him around her children? Glad to see they are coming back. Love to see how the married girls are adjusting to being mothers. Love to see the rest of the family too. Beautiful beautiful beautiful can't say it enough family!